Would your construction project benefit from reduced overall weight and reduced congestion at slab-column connections? Would it benefit from more headroom and greater overall square footage on each floor? Would it benefit from the elimination of drop caps/pile caps for structural and/or aesthetic reasons? For anyone in the industry, the answer to all these questions should be a resounding yes! Stud rails are the perfect solution to these challenges in construction projects with numerous slab-column connections. PJ's Rebar is your #1 resource for stud rail, with a range of sizes and custom configurations available to meet the needs of your unique application. 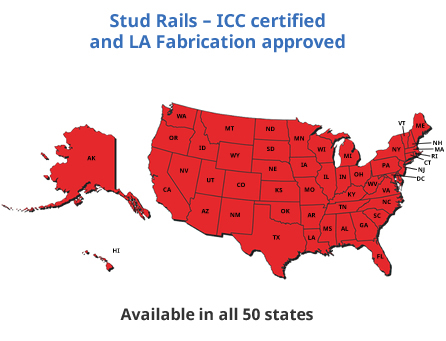 We are an ICC-approved stud rail supplier. Our stud rails are constructed of our special PSR (punch shear resistor) studs and flat steel base rails. All components are manufactured from high quality, high strength ASTM A29 steel (grades 10-10 through 10-20) and meets ASTM A1044/1044M requirements. There are, of course, countless domestic and foreign options available when sourcing material for stud rail manufacturing. Many studrail suppliers simply opt for whatever is cheapest, regardless of origin. At PJ's Rebar, we choose domestically sourced steel whenever possible—all PSR studs and most base rails used in our stud rails are American made. To ensure quality and consistency in our manufacturing processes, our studrails are subject to production tensile testing in accordance with AWS D1.1-10 regulations. Tests are performed by independent, certified third-party labs who provide us with full test results and documentation. 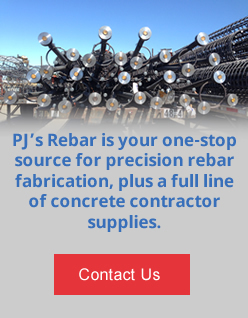 PJ's Rebar maintains electronic records of all purchase orders and related paperwork and documentation. This makes part traceability easy and gives us a handy reference for lot number, heat number, and other important information regarding your order. This is important not just for quality control, but also to provide consistency for your projects: if you need to order additional stud rails, our electronic records make it easy to ensure that you get products that match the first batch. PJ's Rebar is ICC approved. We are your #1 source for standard and custom-specified stud rails. Request a price quote, or contact us for more information.